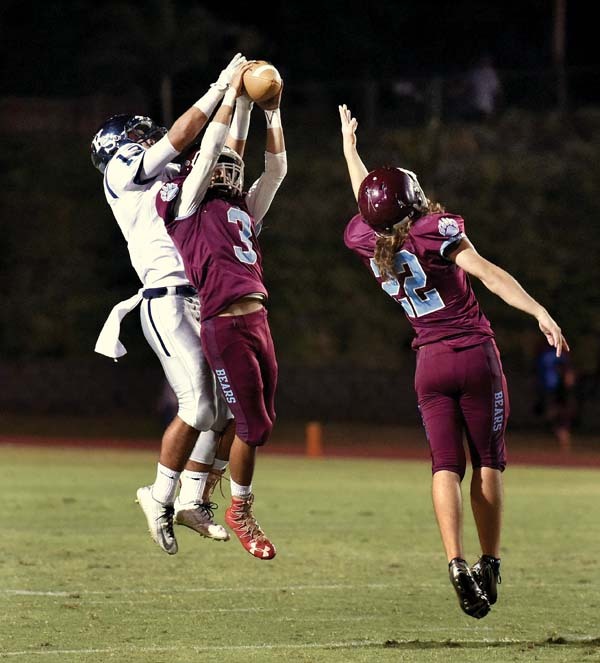 WAILUKU — Chayce Akaka has showed many times that he can do just about everything on the offensive side of a football field. The two-time Maui Interscholastic League Offensive Player of the Year took things to a new level Friday night, though. Putting the Baldwin High School football team on his shoulders, he accounted for all seven of his team’s touchdowns in a 46-14 win over Kamehameha Maui at War Memorial Stadium. 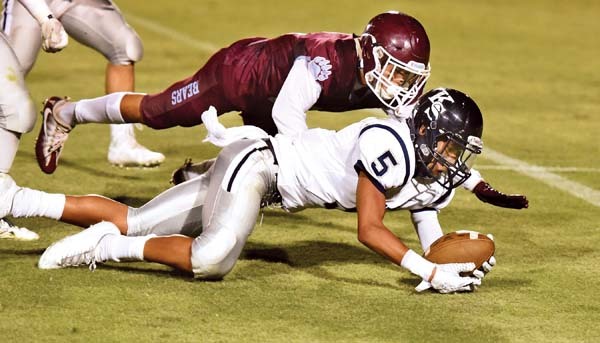 The Bears (2-1) can clinch the MIL Division I first-round championship today with a Maui High loss to King Kekaulike, or by beating the Sabers next week. The Warriors (2-1) will play for the Division II first-round crown against Lahainaluna next week. The Bears led 32-7 halftime behind Akaka’s all-around performance. He was 7-for-11 passing for 127 yards and three touchdowns, caught three passes from backup quarterback Isaiah Kusunoki and ran 11 times for 98 yards and two scores. He punted three times for an average of 37 yards, kicked off eight times — with three touchbacks — and kicked the Bears’ final two extra points. 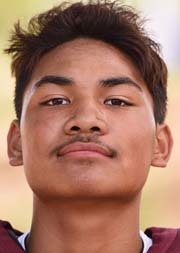 Akaka finished with five touchdown throws — three of which went to Maluhia Plunkett — 263 passing yards, 70 receiving yards and 100 rushing yards with two short touchdown runs. Akaka’s first two completions were touchdown passes of 21 and 31 yards to Plunkett in the first quarter. 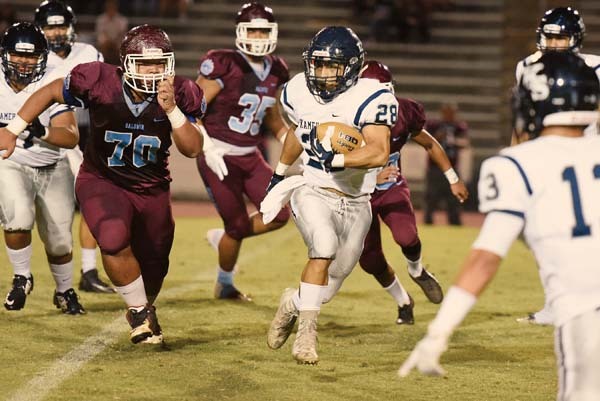 Early in the second quarter, Nathan Facuri caught a short pass in the flat from Kainoa Sanchez, broke the initial tackle, and raced for a 52-yard touchdown to bring the Warriors within 13-7. Then Akaka switched to receiver and caught three passes, all for first downs. On the Bears’ third scoring drive, he caught a 33-yard pass, ran for 15 yards, caught an 8-yard pass and then ran the final yard to the end zone. 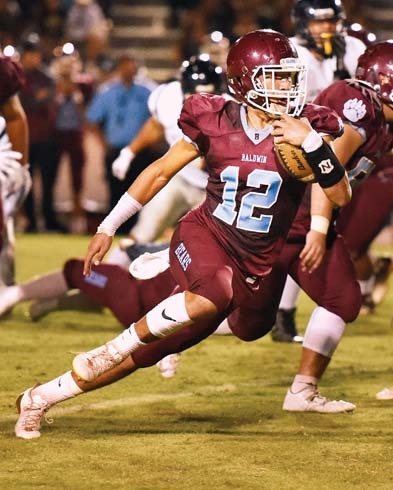 After an in interception by Kili Madrid gave Baldwin the ball at its own 40-yard line, Akaka hit Kainalu Lacno for 26 yards, ran twice for 13 yards and then hit Lacno for a 1-yard touchdown pass. Akaka’s 3-yard scoring run with 12 seconds left in the first half capped a seven-play, 76-yard drive that began with 1:35 remaining. Akaka was 4-for-5 on the drive for 58 yards, including a 29-yarder to Lacno. Akaka also had a 15-yard two plays before the score. On the Bears’ first possession of the third quarter, Akaka completed passes of 54 yards to Brayden Reys-Sojot and 19 yards to Plunkett for a touchdown. In between, Akaka caught a 25-yard pass from Kusunoki and ran for 2 yards. Baldwin activated the mercy-rule running clock with a 13-yard scoring pass from Aka­ka to Nainoa Keahi with 8:51 to go. Keahi, regularly a defensive end, caught the ball twice in the end zone on plays that were called back by penalties before his score that counted. Kamehameha turned off the running clock on Sanchez’s 7-yard touchdown pass to Dane Abarra with 4:40 left. On the play before, Facuri caught a 50-yard pass from Sanchez. An apparent 67-yard scoring run by Kusunoki with 2:08 to play was called back by a block-in-the-back penalty. B–Maluhia Plunkett 21 pass from Chayce Akaka (Plunkett kick), 7:43. B–Plunkett 31 pass from Akaka (kick failed), 2:21. KSM–Nathan Facuri 52 pass from Kainoa Sanchez (Michael Singh kick), 10:32. B–Akaka 1 run (run failed), 9:39. B–Kainalu Lacno 1 pass from Akaka (kick failed), 7:10. B–Akaka 3 run (Plunkett kick), 0:12. B–Plunkett 19 pass from Akaka (Akaka kick), 1:59. B–Nainoa Keahi 13 pass from Akaka (Akaka kick), 8:51. KSM–Dane Abarra 7 pass from Sanchez (Singh kick), 4:40. Junior varsity–Baldwin 13, Kamehameha Maui 0.